Many former insomniacs claim to have put an end to sleeplessness they had for so long just by using the Gravity Blanket, a type of weighted blanket. But, we also have many current sufferers who aren’t sure if this blanket can really help them sleep better too. Even more fascinating is that they are willing to try anything to help them fall asleep faster. Are you in this group? Are you tired of taking melatonin supplements each night before you sleep? Gravity Blanket Review – What’s All This Hype? What is a Gravity Blanket? How does it Work? What Else Can You Do With Gravity Weighted Blanket? Where to Buy Gravity Blanket? What about breathing techniques and lavender bath salts? Can Gravity blanket help me win the war against insomnia? We guess these are the question playing in your mind. The good news – we are willing to provide you with satisfactory answers in this Gravity weighted blanket review. 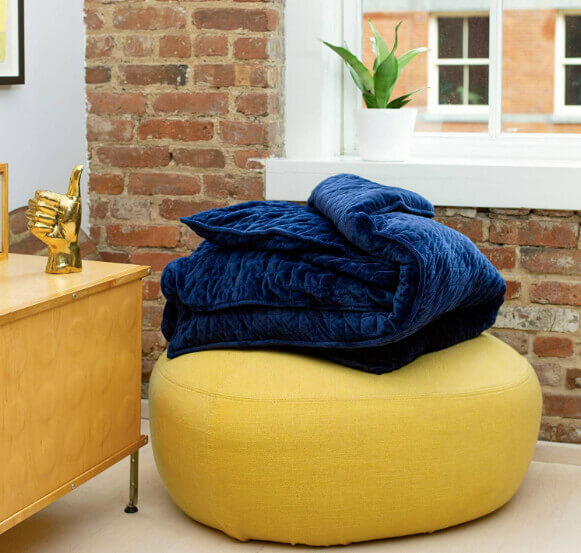 Gravity’s model of weighted blanket started as a Kickstarter project back in 2017. The plan set Gravity up for success after helping the firm raise more than $4.7m from about 24k backers. This money helped the company to create a gorgeous, one-person blanket weighing up to 25lbs. In fact, the brand grew fast and even made it to the list of top 50 Best Inventions 2018 pointing to the role it played in solving stress and sleep. Today, the manufacturer boasts of selling over 60,000 weighted blankets raking in more than $15m in sales. 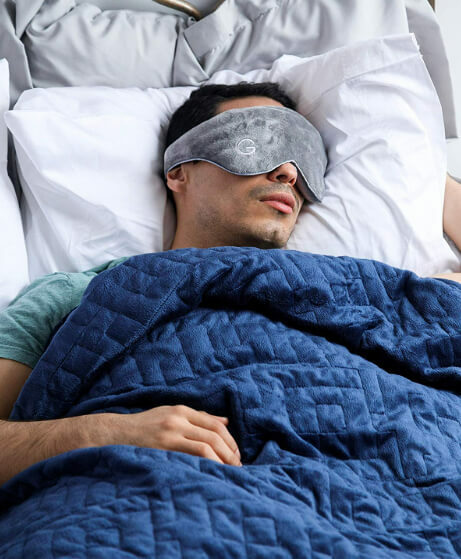 Gravity has expanded its line and now produces weighted sleep masks and melatonin mist to aid you in catching sleep quickly. The lineup also includes a cooling blanket for the so-called hot sleepers. You might be wondering how a blanket weighing 7-10 percent of your body weight could help you sleep better. In other words, what is a gravity blanket? Gravity blanket is a special kind of blanket which differs from ordinary ones in weight. The inner compartments of the Gravity blanket have glass beads sewn into small pockets making up the lining. The beads number in the order of millions and determine the weight of the blanket. The manufacturer claims that its weighted blankets “naturally decrease stress and improve relaxation via deep touch/pressure stimulation.” The resulting experience is similar to a feeling of a rich hug or hold. Some makers of weighted blankets even claim the experience is similar to what “unborn babies in the womb.” Seriously, who can claim to know how such a feeling is like! The weighted pressure of the blanket is distributed uniformly across your body. This invokes and simulates a feeling comparable to a warm hug from a loving or caring partner. Perhaps your dog can explain to you the feeling because it’s similar to the experience it has with a ThunderShirt. Gravity commissioned scientific research to test the efficacy of their line of products. Amazingly, 72% of the test subjects reported improved sleep. Several other manufacturers of this kind of blankets reported almost similar results from their own studies. Furthermore, scientists in the field of behavioural sciences agree with claims that deep pressure stimulation can help deal with insomnia, anxiety, stress, ADHD, autism spectrum disorders. We also set out to test whether the claims are true by conducting a test of our own. We bought two of the original Gravity weighted blankets from Amazon. One of us who weighs 118lbs used a 15lbs (72″ x 48″) blanket while another team member weighing 184lbs used a 20lbs unit of similar size. Both had told us they have problems falling asleep and maintain a deep sleep throughout the night. After seven days of use, both reported reduced stress and anxiety, falling asleep right from the time they get to bed and sleeping deeply throughout the night. We could attest to their claims because we realized their moods were elevated and they performed better at work. Gravity recommends you use a weighted blanket that’s 10 percent of your weight. The options available are 15 lbs, 20 lbs and 25 lbs depending on how much you weigh. There is a weight chart to help you choose the right weight for you. Sorry couples! The gravity blanket is designed for use by one person at a time. But, it’s wider than your regular twin-size comforter but smaller than a full size one. In precise terms, your partner is not welcome to share in your delight – he/she got to buy their own. Sleeping – is that all I get after spending $$$ buying a weighted blanket, you may ask? No, there is more. The blanket will not just help you sleep better. You can use it on the couch while watching your favourite TV programs, series or movies on Netflix, Amazon Prime Video, Hulu or any other streaming sites. A friend who heard that we were planning a review article of Gravity weighted blanket loves using the blanket whenever he is meditating. He claims to enjoy more positive mood, self-discipline and better pain tolerance (he is neuropathic). Many reviewers say the blanket is so comfortable and relaxing that they fell asleep watching their favourite television programs. But things get hotter as the night progresses with increasing risk of overheating. However, we realized it’s easy to avoid becoming overheated. Gravity’s comfy micro-plush exterior cover is easily removable allowing you to sleep with a pure cotton inner lining to reduce the heat. You’ll have to contend with reduced softness and luxury anyway. Imagine waking up in the night to answer to an urgent call of nature, but fast having to deal with something a little more than 10% of your body weight. You may think twice about honouring that call despite its urgency, but again, you’ll have to deal with the consequences of your decision. We do not know about you, but most of us do not like seeing a heavy blanket lurking on our queen size bed. Obviously, it would be an eyesore to you. So, you’d think of folding it. We wonder how easy that would be if yours weighs 25 pounds. We believe you’d want to give the Gravity blanket a trial, but a hefty price tag proves it not for everyone. But if you can afford it, who can stand on your way to a potential life changer for you? Your lovely pet will struggle to understand why she must be left out of the comforting hug. But she is not welcomed to snuggle or get under the blanket to share it with you unless you care more about her feelings than her life. Can a simple, howbeit heavy, blanket compare to pharmaceuticals, natural remedies, and meditation in helping deal with insomnia and mood issues? Well, it’s difficult to make a comparison because only those who have used both the blanket and the other remedies can tell certainty their experience. So, we read a few reviews by verified purchasers. Of the craziest reviews we read, one man claimed he felt like being in her mother’s womb, something they had not experienced while on medication or meditating. A majority said they felt calm, relaxed and in a better mood. Still, others equated it to taking an overdose of sleeping pills. Many anxious, stressed and insomniac individuals love gravity weighted blanket because they claim it is as effective as the medications they take yet there are no side effects to worry about. If you have decided to buy gravity blanket, then you have either two places to order from – Gravity blanket official website and Amazon. We prefer Amazon because of its quick delivery and support. Also, you might get the blanket on a discount. We are confident you’d love to try the Gravity Blanket. It has many proven benefits in alleviating restlessness and sleeplessness associated with insomnia, chronic pain, ADHD, high anxiety, posttraumatic stress disorder, and other mood problems. It may be more expensive than other weighted blankets that claim to offer the same performance, but that’s what you should expect from a high-quality product. 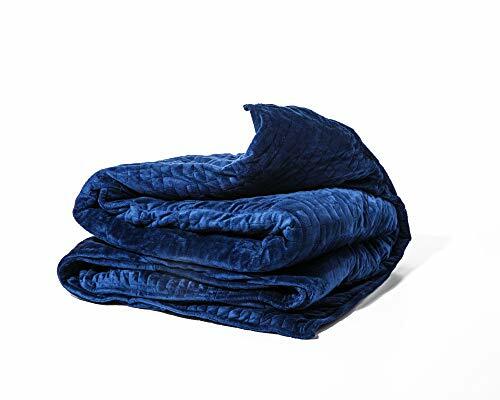 Other than that, if you are really concern about saving some bucks, you can also try the Quility weighted blanket which comes at an affordable price. But do remember, you cannot get all the premium features at a budget price. What are your expectations from the Gravity Blanket? What’s your purpose of buying it? Do share your thoughts in the comments section below. We would be happy to know your views. There is no doubt that the Gravity Weighted Blanket really works in helping you sleep better. The clearly distributed weights adjust really well over your body so that you can feel calm and relaxed after a day of rigorous work. Suitable for general use to recover from stress, anxiety, PTSD, low self esteem and underconfidence. Found to be really useful for IT, Consulting, Banking, Business and Corporate professionals.